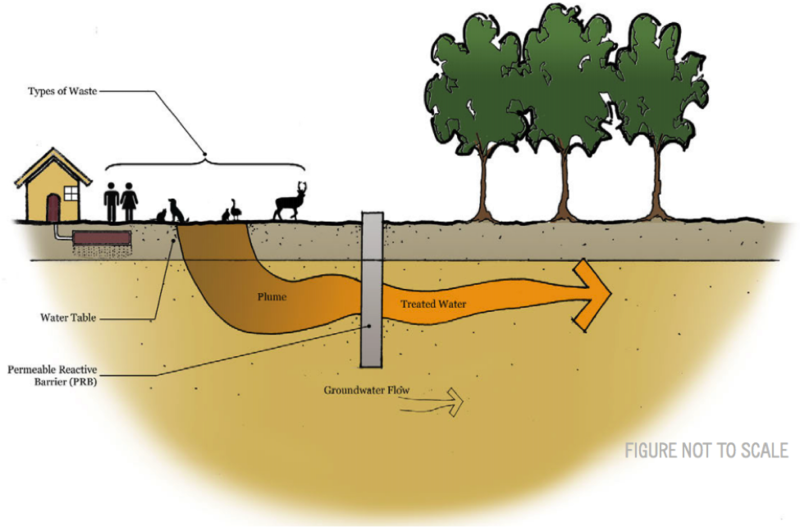 Permeable Reactive Barriers (PRBs) are permeable walls installed below ground that use carbon sources and microbes to remove nitrogen from contaminated groundwater. As groundwater flows through a PRB, the reactive material out of which the wall is made traps potential contaminants. 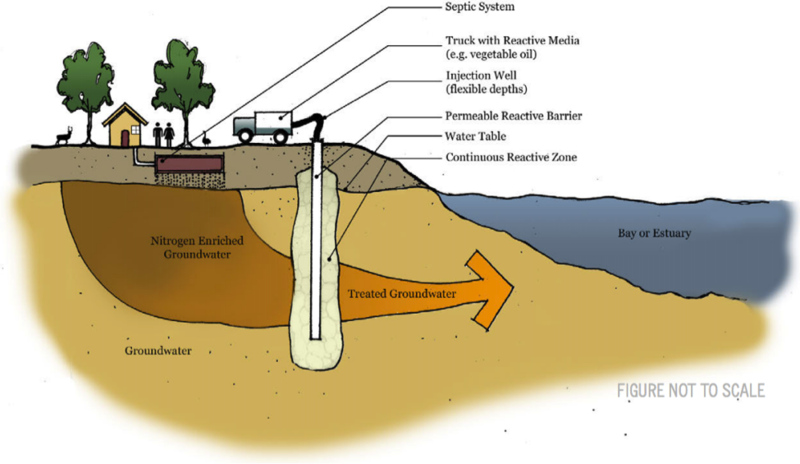 A permeable reactive barrier (PRB) is a trench or well comprised of a reactive media that removes contaminants from groundwater. PRBs are situated perpendicular to groundwater flows in order to maximize contaminant interception. There are two primary configurations for PRBs: trenches and injection wells. A trench-style PRB is typically constructed by digging a trench to a certain thickness and depth and then filling it with some type of reactive media. Diagram of a trench-style PRB. Source: Cape Cod Commission. Diagram of an injection well PRB. Source: Cape Cod Commission. The Cape Cod Commission’s nitrogen removal rate estimates for PRBs. From numerous studies conducted over the past decade, PRBs have proven to remove 70-100% of nitrate in groundwater. Because nitrate removal depends on a biological process requiring a specific environment, it can take up to 6–12 months or more for the system to achieve optimal microbial growth and nitrate removal rates (The Interstate Technology & Regulatory Council PRB: Technology Update Team 2011). There is also a seasonal component to PRB performance. According to a PRB pilot installation that had been operating for 15 years in Southern Ontario, nitrate removal rates were found to vary exponentially with temperature, with the highest removal rates in the summer months. PRBs can also provide benefits beyond their intended purpose. For example, the organic substrate used for nitrate capture in groundwater also promotes biological reaction and capture of other contaminants such as chlorinated solvents, energetics and explosives, inorganics such as chromium, and radioactive constituents. A PRB with ZVI media installed on Ashumet Pond, for example, was primarily designed to attenuate phosphorous, but also proved to reduce nitrate. It has been found that soluble organic carbon from the PRB media may migrate beyond the constructed PRB zone and therefore provide an extended treatment zone downgradient (The Interstate Technology & Regulatory Council PRB: Technology Update Team 2011). Once installed, most PRBs are operated as passive or low-maintenance systems, with performance monitoring typically conducted on a quarterly to annual basis. Depending on the chemical processes undertaken in the PRB medium, the PRB could potentially remove “desirable” constituents from groundwater. It was found that the anoxic water from the PRBs that flowed to the seepage interface decreased sediment redox potentials in the area. Compared to the control locations outside of the PRB influence zone, decreases in the amount of benthic infauna were found in the area of lower sediment redox potential (Vallino and Foreman 2008). Another disadvantage to PRBs is that certain site conditions can decrease the effectiveness of the PRB medium. Elevated sulfate concentrations in the influent may shorten the life of the PRB reactive organic media and cause production of ammonia. Additionally, a low pH environment may require addition of a buffering agent to provide the proper environment for denitrification to occur. Can PRBs be used to filter out other pollutants besides nitrogen? Yes, PRBs are able to remove other contaminants from groundwater flows, including phosphorous, as is the case for the zero-valent Iron PRB that has been installed at Ashumet Pond. Oftentimes PRBs that are intended to remove a certain pollutant that is highly concentrated in one area result in co-benefits for the removal of other contaminants, as well. What are the costs of installing a PRB? In order to determine lifecycle costs, one crucial determinant is the lifespan of the reactive medium and how often it needs to be replaced. Researchers in the CICEET report indicate that the proper metric for determining PRB medium lifespan relies on determining the primary mode of nitrate removal within the PRB medium. This is important in understanding whether wood-based organic media needs to be replaced or rejuvenated over time. Nitrate removal can occur via several mechanisms, which can differently affect the reactive longevity of the medium. If conditions are favorable for cultivating denitrifying bacteria (proper pH levels, redox potential, and dissolved oxygen concentrations), the assumed method of nitrate removal is via denitrification, which does not significantly reduce the reactive lifespan of the media. However, nitrate removal can also occur via biotic or abiotic nitrate adsorption on the wood, which is thought to lower medium effectiveness over time. Why should this be implemented on Cape Cod? PRBs have been shown to remove 70-100% of nitrate in groundwater and thus have tremendous potential to help mitigate the problem of excessive nitrogen in the waters on Cape Cod. Additionally, installation of PRBs can provide economic opportunities for local business, as PRB construction work can be contracted to local companies. Furthermore, since PRB installation requires digging trenches that perhaps intersect water and gas pipe lines, the opportunity to improve other infrastructure can be undertaken simultaneously to PRB installation. Where has it been successful? Click here to see an interactive map to green technologies along the Cape. Since 1994, PRBs have been installed nationwide and have succeeded in removing targeted contaminants from groundwater (The Interstate Technology & Regulatory Council PRB: Technology Update Team 2011). Several PRB implementation projects, along with their respective reports and publications, have set the precedence for PRB performance and reliability. In a report published by the NOAA/UNH Cooperative Institute for Coastal and Estuarine Environmental Technology (CICEET), pilot-scale NITREX™ PRBs, whose medium consists of woodchips and lime covered with local sand, were installed along Waquoit Bay and Childs River in 2005. A 50’ PRB was installed on a beach, and a shorter barrier was installed on a private lot bordering the estuary. Both the Waquoit Bay and Childs River PRBs achieved 99% nitrate removal. Cape Cod Commission. “Technology Matrix.” Vol. v22. February 13, 2014. CDM Smith. “Falmouth, MA PRB Demonstartion Project.” Status Report, Falmouth, MA, 2013. CDM Smith. Technical Memorandum No.1: Evaluation Criteria for the Permeable Reactive Barrier (PRB) Pilot Project – Final. Technical Memo, CDM Smith, 2013. CDM Smith. Technical Memorandum No.2: Preliminary Site Selection for the Permeable Reactive Barrier (PRB) Pilot Project – DRAFT. Technical Memo, CDM Smith, 2013. The Interstate Technology & Regulatory Council PRB: Technology Update Team. Permeable Reactive Barrier: Technology Update. Technical/Regulatory Guidance, Washington, DC: Interstate Technology & Regulatory Council, 2011. U.S. Environmental Protection Agency. Permeable Reactive Barriers. November 26, 2012. http://www.epa.gov/ada/gw/prb.html (accessed February 12, 2013). U.S. Envronmental Protection Agency. “Evaluation of Reactive Barrier Technology for Remediation of Nutrient-Contaminated Ground Water From a Swine CAFO.” National Risk Management Research Laboratory . http://www.epa.gov/ada/gw/pdfs/research_35.pdf (accessed Februaury 13, 2013). Vallino, Joeseph, and Ken Foreman. Effectiveness of Reactive Barriers for Reducing N-Loading to the Coastal Zone. Final Report, NOAA/UNH Cooperative Institute for Coastal and Estuarine Environmental Technology (CICEET), Woods Hole: Ecosystems Center, Marine Biological Laboratory, 2008.